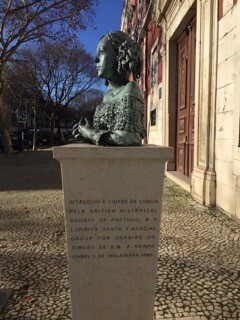 The guided tour organised by the Servicio Cultural da Câmara da Lisboa started in front of the Palacio da Bemposta – right in front of the statue of Catherine of Braganza, the very statue donated by the BHSP to mark the jubilee of Queen Isabella II, sometimes described as the She-Wolf of France and Queen of England as the wife of Edward II, and regent of England from 1326 until 1330. However today's tour took us to meet another key figure of Portuguese history - Leonor de Almeida Portugal, 4th Marquise of Alorna. Born on 31 October 1750 in Lisbon, she died, age 88, in 1839 and is buried in the Cemitério dos Prazeres in the Portuguese capital. Dona Leonor de Almeida Portugal was a Portuguese noblewoman, a painter, and a poet. Commonly known by her nickname, “Alcipe”, the Marquise was a celebrated figure of the Portuguese Neoclassic & Early Romantic literary scene. Her own story reads like a book : Leonor was born into one of the many branches of the House of Távora, Portugal's most illustrious and powerful family which was accused of treason and regicide against King José I of Portugal in a series of events known as the “Tavora affair”. 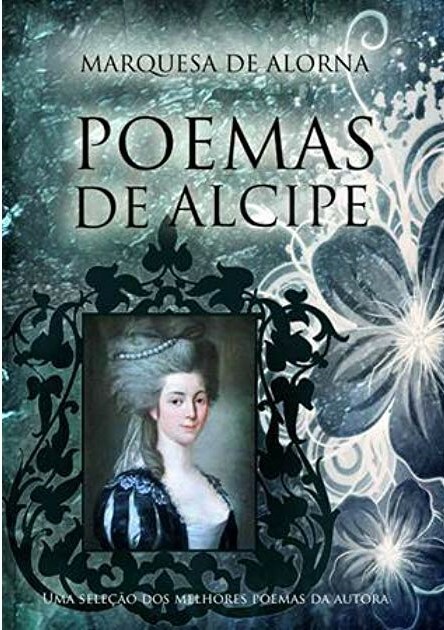 In 1758, Leonor was only eight years old when her maternal grandparents were executed and she and her mother were forcibly placed in the Convent of São Félix of Chelas, until 1777. Likewise, her father and brother were imprisoned in the Tower of Belém. • Elegia à Morte de S. A. R. o Principe do Brazil O sr. D. José; Lisbon, 1788. • De Buonaparte e dos Bourbons; e da Necessidade de nos Unirmos aos nossos Legitimos Principes, para a Felicidade da França e da Europa; London, 1814. • Obras poeticas; Lisbon, 1844. • Estudo Biographico-Critico, a Respeito da Litteratura Portugueza; Madrid. 1869. Freed in 1777 by Queen Maria I, who despised Sebastião José de Carvalho e Melo,the1st Marquis of Pombal,who was seemingly behind the Tavora affair, the family moved to the Quinta of Alorna and Leonor was married to Count Carlos Pedro of Oyenhausen-Groewenbourg, who, with his cousin, had come to Portugal to train the Portuguese army and was then appointed as a diplomat at the Austrian Imperial Court in Vienna, where Leonor herself soon set up a renowned Literary Circle. Whilst there, Leonor often sent her works back to Portugal, most notably a painting entitled ‘Soledade’ to her father, and ‘An Allegory of Conjugal Love’ to her sister, the wife of José, Prince of Brazil and also a copy of a painting by Guido Reni to Queen Maria I.
Leonor and her family moved back to Portugal in 1785. In 1793, when Leonor's husband died, the family subsequently moved to London where she stayed until 1809. The reason for her return was her brother's appointment as Commander of the Portuguese Legion and Major-General in the Napoleonic Forces fighting in Spain. Leonor's daughter, Juliana, became General Jean-Andoche Junot's mistress in Lisbon. Her only son was sent to join the Portuguese Royal Court in Rio. Upon the death of her brother, whilst waiting for the recognition for her newly inherited titles, Leonor and her children stayed at the Palace of the Marquises de Fronteira, where she was to die in 1839. The Campo do Corral and the Largo Conde de Pombeiro now occupy what was formerly a very boggy, run-down plateau, which was transformed thanks to the noblemen and women who lived and entertained in the Palaces that were built there: the Mitelo Palace, the Palacio do Patriarcado, now the Italian Embassy and the much-loved royal abode – the Palacio de Bemposta (Praça da Rainha), which now belongs to the Portuguese Military Academy, although the coat-of-arms of Queen Catherine of Braganza are still visible above the principal doors of the building - which is soon to be visited by the BHSP. Vanda Anastácio : A Marquesa de Alorna (1750-1839) (Lisbon: Prefácio, 2009). Elias Torres Feijó : «Ad maiorem gloriam…feminae. Enlightened Women and the Introduction of Models in Portugal during the second half of the Eighteenth Century» Portuguese Studies, vol. 20, 2004, pp. 73-88. Raquel Bello Vázquez, «Lisbon and Vienna: the correspondence of the Countess of Vimieiro and her circle» Portuguese Studies, vol. 20, 2004, pp. 89-107.